Purchase tickets onboard the ferry. 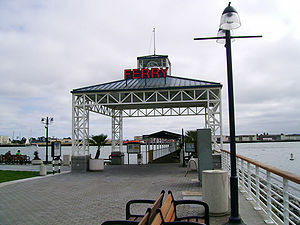 Ferry riders (all except the Giants Ferry) can park free for up to 12 hours at a parking garage on Washington Street (one block from terminal). Validate the parking ticket at one of the two validation machines located behind the glass doors at the ferry gate. When returning, go directly to your vehicle. If you park beyond the 12 hour validation limit, pay for the time beyond the first 12 hours at a parking payment machine located on the 1st floor. This page was last edited on 5 May 2018, at 18:40.